I’ve watched about 5 episodes and have enjoyed each one. I like that there are specific comments made in each episode about different types of categories, which is helpful. It also means you need to watch each episode to see what she has to say since it’s not the same in each show. I appreciate knowing how the family or individuals are changing as they go through this process. It is more than just organizing, it is making their home, their families, and their lifestyle the way they want to go forward. I really enjoyed the family in the apartment, and how the mom started off thinking she was responsible for the organization of everything in the home and keeping it all together, but at the end she and her husband and her kids all realize they all need to be responsible for their own things and the household overall, and how it benefits them as a family. So important for parents to think about this and how we instill this with our children. I for one did not do well at this as a parent, so wish I had! And I agree with you about the papers, there is somewhat more to papers than those 3 categories. If you had spent time in the service storing and laying out your worldly goods for inspection, you will either continue doing that as a civilian or you couldn’t be paid to do anything remotely similar ever again. Anyway, I pretty much fold my clothes like that. I watched the whole season, Kondo’s ways are simple but effective in terms of organizing and also can be applied to our life. Does it “spark joy” has a real meaning to me. I love to read and of course I accumulated hundreds of books, but a lot of them really did not mean anything to me as much as to other people. When Kondo’s book came out I read it and bought the second when it came out. At that time I still have the hundred books, so I pared it down to what I really love and I know that I will re-read them. Now I have maybe 30 or so books that I have on shelves and puts a smile in me every time I see them. I am still in the process of “tidying up” and hopefully will achieve it this year. I also read the Art of Swedish Death cleaning, I was curious about the title so I read it. I told my wife that if I passed away please do not hesitate to throw my clothes, they are worn out and nobody in either of our families have the same size as me. I don’t even want them donated just throw them away. I don’t want her to have the burden of what to do with my well worn clothes. We have lots of books at our house. Some homes I have visited seem to have no more than a couple. But we don’t consider our book accumulation as part of our clutter problem, a problem we definitely have. They do take up shelf space but not closet space or floor space. Winston Churchill, who had more books than we do, said in so many words that even though you can’t read them all very often, you should go through them now and then, pulling them out and touching them. They probably need dusting anyway. I only watched one episode, but in it, Marie changed her order to allow for the individual case and I liked that – no pressure to stick directly to the system. Adapting it for your needs. +1 to Marie. I found greeting the house a bit odd, and in all my KonMarie research, this sort of thing – thanking your items etc was the hardest to get behind. It was just a little too odd for me, two years ago. But since then I’ve had some reflection, and I think that this enables a respect for your belongings and home. I certainly looked at my house differently when I thought what an incredible invention it is and appreciated that it kept me warm (mostly) and safe. It’s made me think more about acquiring items, and eased a sense of guilt when I throw something out. I’m still not going to tap all my books to wake them up though, that’s too far for me. Whilst I will take some of the techniques and not others, Marie gets a big tick in my book for her evident respect for the individual and their belongings. I watched the whole season and loved it. The show does a good job of featuring different types of families in different situations (empty nest, widow, downsizing, newlyweds, families with younger children, , etc.) I read Marie Kondo’s books a few years ago and followed her tidying methods; they really work! As for her practice of “greeting” each house she works on or telling people to “thank” objects they are getting rid of, these rituals are influenced by Marie’s lifelong practice of Shintoism. While I respect her beliefs, I don’t share them, so I just ignore these things and embrace the rest of her KonMari method. The problem, of course is when spouses are at opposite ends of the tidying spectrum (I am more of a minimalist and like to get rid of stuff; my husband likes to save stuff). 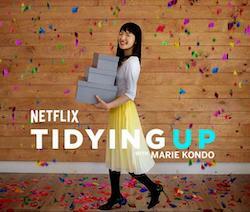 The Marie Kondo TV series deals with this problem in several episodes. On the show, the “savers” wind up getting on board and pitching stuff; that hasn’t happened yet at my house. My solution is to sort and box up my husband’s stuff (mostly papers) when he’s not around; I don’t throw his things away without permission but at least they’re boxed, labeled and stored out of sight. Some people have complained about Marie Kondo’s attitude toward books. She isn’t against having books but urges people to winnow them down to the couple dozen or so that belong in your personal hall of fame. Her premise: Even if you have books that give you pleasure and that you MIGHT want to read again, you’ll likely never reread them so get rid of them. You can always get them from the library. I say, if you’ve haven’t read or referred to a book in the last year, you probably won’t, so don’t keep it (unless it’s a special favorite that’s out of print). I’m a book lover, and, while I have gotten rid of some books via the KonMari method, I have kept my favorites by gradually replacing them with Kindle editions. (Kindle versions of many older classic books are available FREE). I love my Kindle! IMO, Kondo is so wrong about books. I have many books that I have read (and a few that I haven’t, that were given to me by someone important in my life or on some important occasion in my life). I have books that are first editions and/or are inscribed to me or a family member by the author. I don’t need to READ these books for them to “spark joy”. They already do that when I look at them: I’m happy to see them, and I think about what they represent to me. But I will give Kondo credit: She’s figured out how to get rich! Watched Tidying Up like a meditation. So interesting watching people’s emotions about the stuff. That’s what’s hidden beneath & important to get to. Her “greeting” to house, to me, is more like a focusing and meditation. Why not? Probably a lack of focus that began all the clutter. Speaking of books again, few of my treasured books are available at the local library. And I would never replace books with an electronic device. In fact, two of my Christmas gifts were books that replaced older books that had been literally worn out and were falling apart. Besides, I wanted something with larger print, too. In response to Sarah on Marie Kondo’s clothes folding method: While I have not read her books yet (I plan to one day), a couple of years ago I did read about her folding method. My dresser drawers were over-stuffed, and Marie’s method intrigued me, so I emptied the drawers and re-folded everything her way. Not only can I see parts of all my clothes when the drawers are open (so things don’t continually get forgotten because they’re under other items), but my drawers that were over-stuffed actually had quite a bit of room left over! I’ve taken photos of my drawers to show to others, who have then given this method a try. The consensus: Neither I, not others who have tried this method, will ever go back to the “usual” way of folding clothes (including socks). So if you haven’t tried this method, I highly suggest that you do try it and see for yourself. Still thinking about all these things. There was even a article about her in yesterday’s Washington Post. None of this stuff sparks joy in my life, nor does it allow me to fulfill my life’s dreams (after all, I’m 72). What it does, however, is when I’ve cleaned, polished, sorted, folded, spindled and put everything back where it belongs, is to give me a feeling of satisfaction. Probably few would agree with me, but there is something about polishing your shoes that is a little stress-reducing. Same with ironing (that might be going off the deep end!). Alternately, having a sink full of dirty dishes–put there by someone else–is, well, disturbing. But not exactly stressful. The dirty dishes are easy enough to deal with.